When you’re ready to have your satellite dish installed, you’ll be surprised at how simple the process can be. We strive to get you online quickly. The following seven steps outline what to expect in an Exede satellite Internet installation. You will schedule the Exede Internet service installation at the time of purchase or over the phone when an installer calls you. Typically, satellite dish installation takes one to three hours, and we’ll need you to be home for the full length of the installation. 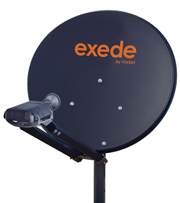 Your satellite dish installer will arrive in a vehicle marked with the Exede logo. He will be wearing a shirt with our logo as well. Upon arrival, you and your installer will review the work order to confirm the details of your satellite installation. If you’ve already considered where you would like your satellite dish to go, tell the installer when he or she arrives. Together you can choose a location with a clear view of the southern sky, ensuring the best possible satellite signal. Keep in mind that a satellite dish can be mounted in a number of ways: on your roof, under an eave, along the side of your home, or on a pole near your home. At this point your Exede satellite installer will assemble the satellite dish and the mount, and then install it on your house or on a pole mount. Once the satellite dish is operational, the installer will precisely align the dish to point directly at the Exede satellite in outer space (22,000 miles above the equator) and lock in its location to ensure you maintain a strong signal. Meanwhile, you can relax inside your home until the installer needs to connect the modem to your computer. The installer will run a cable from the satellite dish through the home and to your computer by way of the modem. You should have your computer in a place that makes it easy to hide the cables for aesthetic reasons. 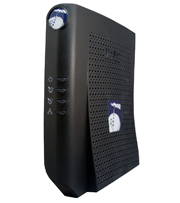 The Exede satellite Internet installer will sit down at your computer to activate the modem and confirm that you can successfully access the Internet through the satellite. Once this step is complete, your installer will finish the satellite Internet installation, help you set up an email address, and optimize your computer for maximum performance on the Exede network. You’re now an official Exede satellite Internet user! Your installer will walk you through the online terms and conditions policy that we require all customers to review. The next step is to confirm with the installer that you have up-to-date antivirus software installed on your computer. You will then be able to browse the web, send email, download music and photos, and enjoy the Internet as you like. As you can see, the satellite installation process will take very little effort from you — we take care of all the details. Learn more about how satellite internet works or find more information about Exede satellite Internet plans and pricing.